Anja and The Dreamers are a dynamic, all-female, power-trio, rock band performing an eclectic collection of pop, alternative and classic rock music with enjoyable originals in a wide-variety of settings and venues. They also perform acoustic shows featuring a wide range of popular hits as far back as the 60's. 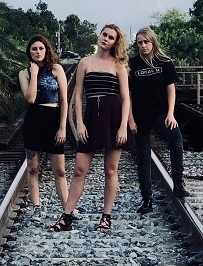 Anja and The Dreamers recently released their sophomore EP "Tyranny" which is available on Spotify, iTunes, iHeartRadio, Apple Music,YouTube, Amazon Music and Google Play. Selections from "Tyranny" were aired on Orlando's Rock Station, WJRR 101.1. Anja and The Dreamers have been featured in Brevard Live Magazine. They won the AVID Original Music Series hosted at the Legandary Lou's Blues competing against 50 other Original local bands. Their music has been played on 98.5 FM, The Beach, 89.5 FM, WFIT and 91.5 FM, WPRK. They can be heard as far away as England and France through internet radio. Anja and The Dreamers will be heading back to the recording studio next month to record their first full length CD. They also perform at local festivals including Melbourne Art Festival alongside Levon, who toured with Willie Nelson and many others! They have performed at the popular Boondocks, Sunset Pier and Rick's in Key West. They also performed at the Boot Hill Saloon in Daytona Beach during Spring Break.